Playing outdoors is important to the physical, mental and psychological development of children. Paediatricians recommend up to an hour’s worth of outdoor playtime daily for children, but even half an hour could do wonders. Playing outdoors helps children learn and adapt to their surroundings, and in the process, improve their motor skills, coordination, spatial awareness, and cognitive and problem-solving ability. In addition, exposure to sunlight helps synchronize children’s biological clock which improves the body’s internal processes and strengthens its immune system. However, getting children to go outside and maintain their interest on a daily basis can be a challenging task. This is why parents must ensure that outdoor time is not optional, and eliminate all distractions inside the house (such as TV and computer). In addition, parents must also ensure that they keep their little ones engaged and having fun with outdoor toys for children. 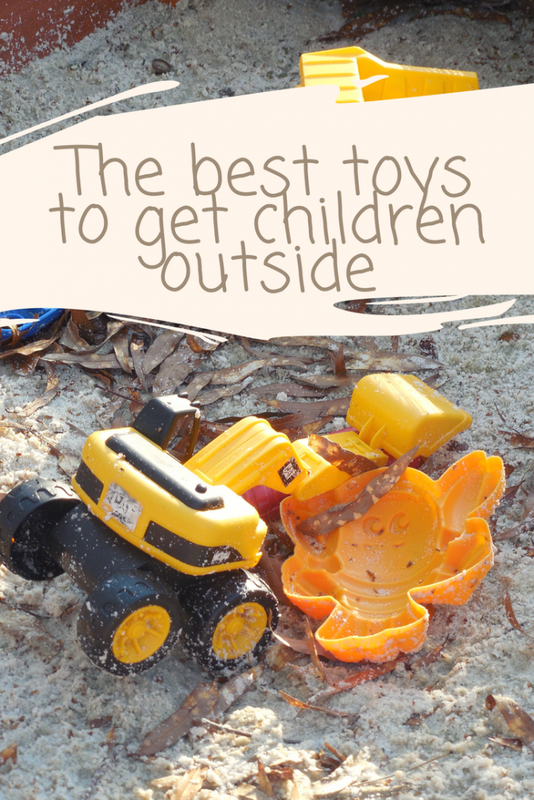 With that in mind, we have prepared some ideas for outdoor toys that you can incorporate into your current play area. • Swing and Slide: A garden swing set is a perennial favourite with children of all ages, so you can’t go wrong with this one. However, if there is not enough room for a large unit, you can consider getting smaller ones that can be hung or affixed to the house. There are also small units which can be hung from tree branches or rooftops that are perfect for toddlers. A slide is also very popular with children. The thrill of sliding down is very addictive to them. Many retailers offer inflatable slides, which are cost-effective and perfect for small gardens. • Sports and Games: Children love to play sports games. A beach ball and miniature football goal and net combination promise hours of fun. A ball and basketball hoop combo is also popular. Organise a competition between the toddler and other family members. Another firm favourite is a bounce house. Just make sure you buy a fully enclosed unit to prevent toddlers from bouncing to the ground. • Sandbox: A sandbox, along with the accompanying spade, buckets and moulds, is a great choice for group activity, especially if there are other young children in the family. 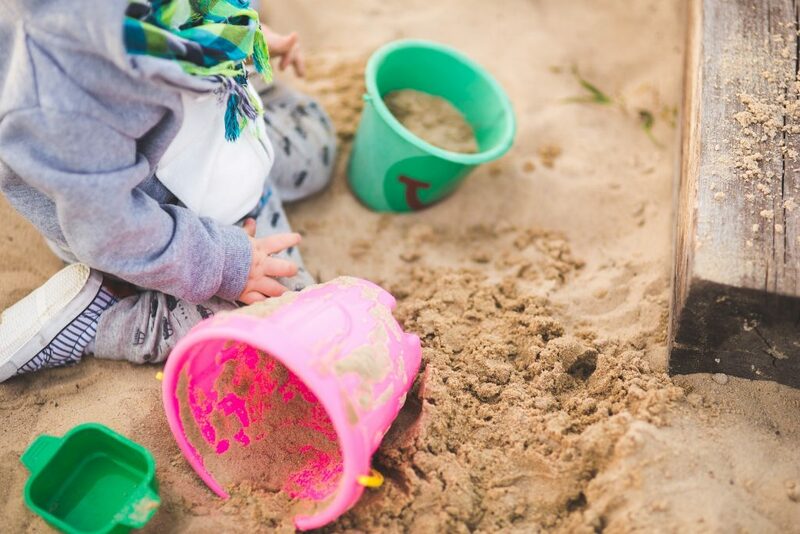 Building structures inside the sandbox actually helps cognitive development. If your garden is too small, you can get plastic sandboxes from most major retailers. Simply fill it in with sand. Speaking of sand, remember to sift through them to ensure no insects have burrowed inside. Remember to get a tarp as well so you can cover the sandbox and prevent rain (as well as insects) from going in. • Art Easels and Supplies: Depending on the age of your child, get either a chalkboard or a white board for the easel. Supply your children with crayons, chalk or even water colours, give them a theme, and watch them go! Children genuinely never get tired to express themselves artistically. • Projectiles and Blasters: Foam ball blasters, foam dart guns and squirt guns are just a few examples of garden toys for your toddlers’ armoury. Single and group battles using these foam and water blasters will have you child screaming with delight. You may want to consider getting a few safety goggles as well to protect your child’s eyes – soft foam can become heavy once soaked. We find our daughter enjoys exploring or running/racing so doesn’t always need ‘outdoor’ toys. One surprising one is a camera – we walk a lot and she enjoys taking photos of new things, also collecting natural stuff for collages later. I remember when I was a kid I used to play a lot with balls, together with the children living on the same street. It was a great way to get rid of the extra energy and to have fun in the same time. We used to play everything, from football, to volleyball and tennis. My little boy is desparate to get out in to the garden. But I’m a very mean Mum and have denied him access due to the ravages of Winter, not only is it muddy out there, but a mess and so very very cold at the moment. But I love it when he plays out there (once the weather improves), and have found the best thing ever has been sand, plastic dinosaurs and digger trucks! A good list, I didn’t know there were so many different types of fixings for slides. I feel like I probably could have gotten away with one in our old place now. Unfortunately our new place hasn’t got a garden but we’re right next to the park and always scooting around. This is so important to teach our kids to play outside instead of playing and using gadgets. They will learn a lot about playing and exploring when they play outside the home. Yeah! It’s so important for our little ones to explore the outside world and not just lurk at home with online games. My daughter always loved outdoor play time. She had a little wendy house she played in in all weather. The outdoor fresh air is so good for little ones. My little boy loves being outside so I’ll be trying some of these. This is brilliant, I find that no matter the weather we took the children to play outside and they have become lovers of the outdoors. Rain or shine I find that it doesn’t matter as long as they are dressed accordingly to protect them from the elements. A swing and slide are classic outdoor activities and have always been my favourites! Getting an easel outside is also a great idea – I used to have one in the house and there was always chalk on the carpet..